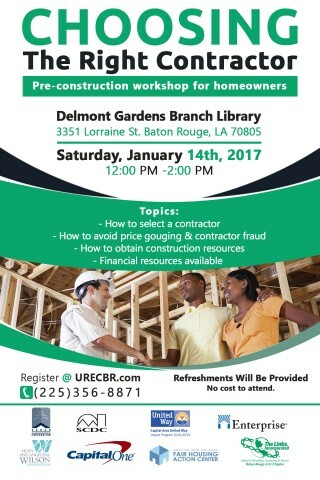 Urban Restoration Enhancement Corporation in partnership with Capital One Bank will host a free Choosing The Right Contractor Seminar, on Saturday, January 14th, 2017 from 12:00-2:00pm at Delmont Gardens Branch Library, 3351 Lorraine Street in Baton Rouge. Event partners and sponsors will giveaway a select number of gift cards to attendees. The seminar is free to attend. Pre-registration is required. For more information, email info@urecbr.com or call (225) 356-8871. To register for, please visit: http://bit.ly/2iAsfHk.